This was my third year serving as principal of Stuyvesant High School. In more than 22 years as an educator, nothing brings me greater satisfaction, fulfillment or intellectual stimulation as my daily service as principal to over 3,400 students, 200 staff members, and thousands of alumni that constitute our vibrant and dynamic family. I tell colleagues and friends that every day I see our students, dance, compete, debate, code, sing, perform, write, create, and problem solve at the highest academic levels. Our students do this with a commitment to excellence and quality. What is not always apparent is that they also do this work with a genuine spirit of collaboration and collective responsibility. The Stuyvesant experience is always greater than the sum of the individual parts because students work together to create something that is exponentially greater, be that robots, theater productions, SING performances, or the most recent issue of The Spectator, our celebrated newspaper. The development of our new Robotics Lab, was made possible with the generous support of alumni Alfred Lin ’90 and Edwin Lin ’93. 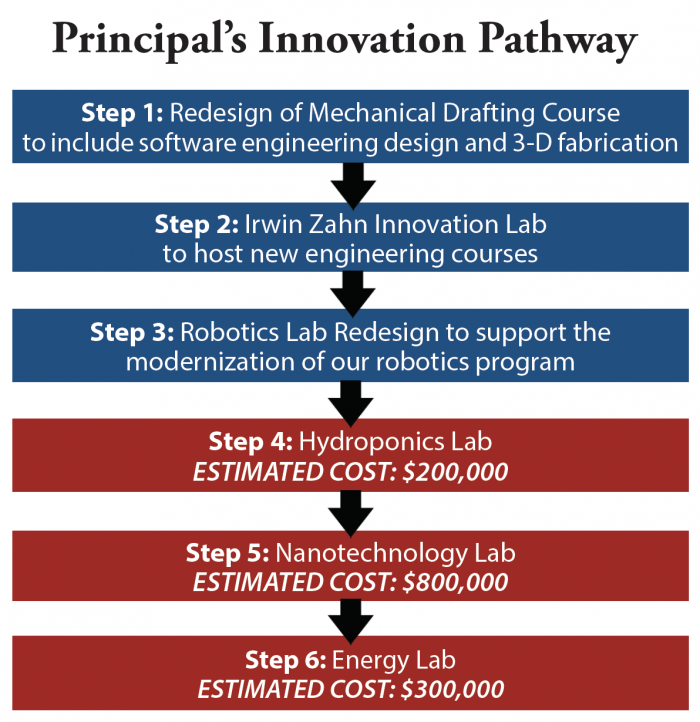 With this funding we will provide updated tools and resources, and will connect two existing rooms to create a space that will accommodate three robotics teams and the different engineering teams. We are also expanding our computer science program by offering an Artificial Intelligence course for the first time this year. This brings us to seven computer science courses, making us the most comprehensive high school program in New York City. We are now exploring the modernization of our computer science labs and, if funding is available, will create an eighth course focusing on Cybersecurity. Our graduates who now attend top CS programs tell us that our computer science program gave them advance preparation for their work as undergraduates. We are currently in the exploration phase of our environmental science initiative to support the intersection of biology, chemistry, and environmental studies. We hope to prepare students for careers in nascent fields of critical importance and to develop well-informed citizens on issues of the environment, sustainability, and policy. This year we began a pilot program offering Advanced Placement Environmental Science to incoming 9th graders, using our surrounding environment as the laboratory space. This summer we offered an alumni-funded research program with a focus on environmental science research. To anchor our sustainability initiative we will seek funding to create a hydroponics environmental studies laboratory on the third floor. This lab, along with our new course and summer program, will help build partnerships between environmental university, government, and industry organizations to create opportunities for students well beyond Stuyvesant. Our arts program is also expanding. We are now offering an Artificial Intelligence music course, a guitar program, and a madrigal choir. This spring, with alumni support, we are set to add a Bell Choir to our choral program. When I meet incoming 9th graders I encourage them to seek diverse opportunities and take advantage of the options available. It is through your support that students are able to explore their passions, discover their expertise, and prepare for their future endeavors. I tell them to be intellectually curious, be bold, and contribute to those around them with the knowledge and wisdom they get from their experiences at Stuyvesant. Together we make that possible. Support our students by donating to the Stuy Fund!